To fix in your mind the sort of carving you want to make, it is necessary to put it down on paper. A series of preliminary studies of the project will illustrate the difficulties ahead. It may be of help if I outline briefly the steps I take to commit the new carving to paper before I execute it in wood. For drawing in the preliminary details I use old-fashioned brown wrapping paper for my layout sheet. I do this because it is inexpensive, it takes pencil lines well, it is finished hard enough to stand erasures, and it can be used for shading in. You can throw it away with no regrets. I get a 24-inch wide roll weighing about 60 pounds for something like $6.00 and it lasts a couple of years. Beside which, you can wrap parcels up in it. After a little practice, I find I can make a preliminary sketch almost to full scale, free hand. I call these layout sketches (which may not be the term used by the cognoscenti, but it will do). I start these layout sketches by drawing in the head of an eagle (assuming I am working out a new design for an eagle) in a corner of the paper. Then somewhere else I lay out a section of the wing detail, then somewhere else on the paper I sketch in the pose and usually draw out various variations of these details. By so doing, I fix in my mind many of the details I want to develop in the final design. Usually these sketches will have covered most of the sheet. Starting afresh, I lay out a "box" (or rectangle, if you prefer) the length and width of the carving I am to draw. The box is drawn exactly to the dimensions of the carving. The next step is to draw in centerlines in both directions. The point of their intersection is the exact center of the box. Using these center-lines as reference points, I draw in all the details that are shown in the layout sketches. For the sake of illustration and simplicity the major part of the eagle will be alike on both sides. Usually I draw in the head first, then the outline of the left wing, then the outline of the tail and the bottom rest. All this is only one half of the eagle. The next step is to trace off the outline on thin, transparent tracing paper; indexing * the center intersection of the vertical and horizontal lines and the upper and lower corners of the box. Then I reverse the tracing paper in such a manner that these indexed points coincide with the ones on the working drawing. Backing the tracing paper up with carbon paper, I trace over the outline. The corners of the tracing paper are, of course, fastened down to the drawing board. I check to see that I have gone over all the outline. If I have skipped any part of it, I retrace. The next step, I remove the tracing paper and view the completed outline. Frequently it will be evident that the whole outline is not exactly what I want. 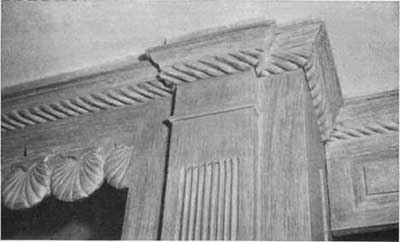 The sweep of the wings may be altogether too greatly exaggerated or the tail outline is too wide or too narrow or out of proportion to the rest of the carving. In other words, I've pulled a "bubu." Correcting these out-of-drawing errors by erasing the faulty parts, I revise one side and retrace until the outline is just as I want it to be. Then, and only then, do I start lining out the drawing with the detail. I usually draw in the feet in the position I want them on the bottom rest. Then I draw out the legs with the feathering indicated, then I draw in the detail of the head, the beak, the cere, eye, nostril and crest. 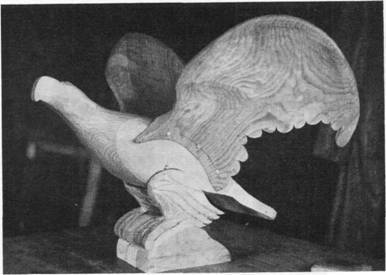 The body and wing feathers are only indicated for the reason I know perfectly well that when I come to this part of the carving I will have thought of a new way in which I want to execute these essential details. * Indexing is simply marking register points on both the tracing paper and the drawing so that you can always overlap the tracing exactly in the same place on the drawing whenever you need to. 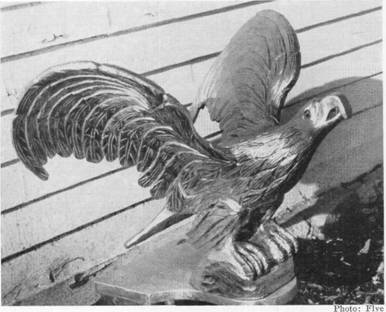 Image 23 A small American Eagle showing the various parts assembled after being profiled, jointed and bosted out. The completed eagle is shown in the next Imagegraph. A compound carving. Often it is a great help to make additional drawings such as cross sections, both in the vertical plane and the horizontal plane, using the centerlines as the reference points for these sections. If the carving is to be done in "alto-relievo," I sometimes shade in various portions of the planthat is, the layout drawingto show to what degree the detail is to be raised and what the final carving is supposed to look like. These drawings are the final preparatory steps. The working drawings are made from tracings of the completed layouts.